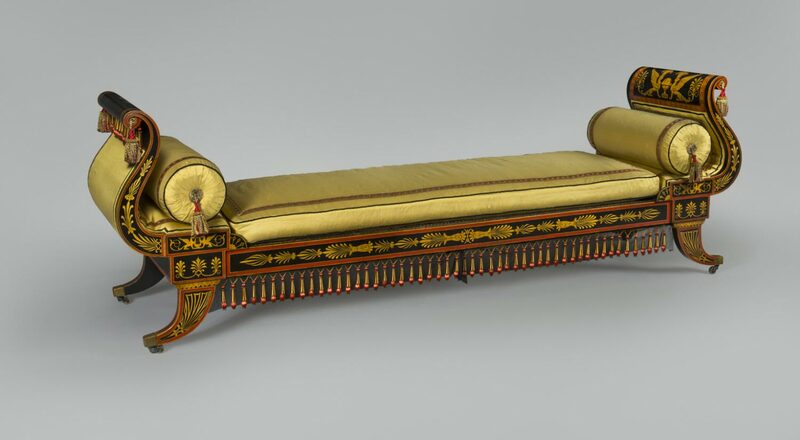 Designed by Benjamin Henry Latrobe, American (born England), 1764 - 1820. Decorated by George Bridport, American (born England), 1783 - 1819. Made by John Aitken, American (born Scotland), c. 1760/65 - 1839. British-born architect B. Henry Latrobe is known to have designed furniture for the interiors of many of his commissions and, between 1808 and 1810, at least two painted furniture commissions-for the White House of Dolley and James Madison that was destroyed in the 1814 burning of Washington, D.C., and this one, which was made for the house of Philadelphia merchant William Waln and his wife Mary Wilcocks Waln. A Philadelphia carpenter named Thomas Wetherill signed the reverse of the pier table mirror in a bold script, proudly laying claim to manufacturing at least that table. George Bridport, a London-trained draftsman and ornamental painter of walls and furniture, executed the ornamental wall decoration for the drawing room of the Waln's house and the painted decoration on this set of drawing room furniture. 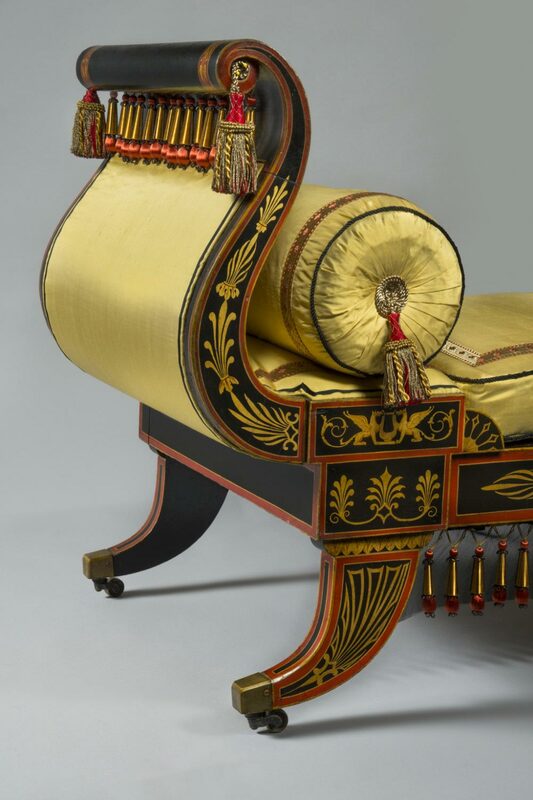 The technical quality of the decoration far exceeds that on painted furniture made in other American cities during this period. Latrobe gave directions for the design of ornamental wall decoration in the Waln's drawing room: "friezes . . . more than two feet broad with Flaxman's Iliad or Odyssey in flat Etruscan color, giving only outline on a rich ground." A room corresponding to those dictates was created in 1987 for the Museum's exhibition Federal Philadelphia, 1785-1825: The Athens of the Western World. Benjamin Henry Latrobe's designs for the interiors and furnishings of the town house of the Philadelphia merchant William Waln, begun in 1805, were among the architect's most comprehensive domestic projects. 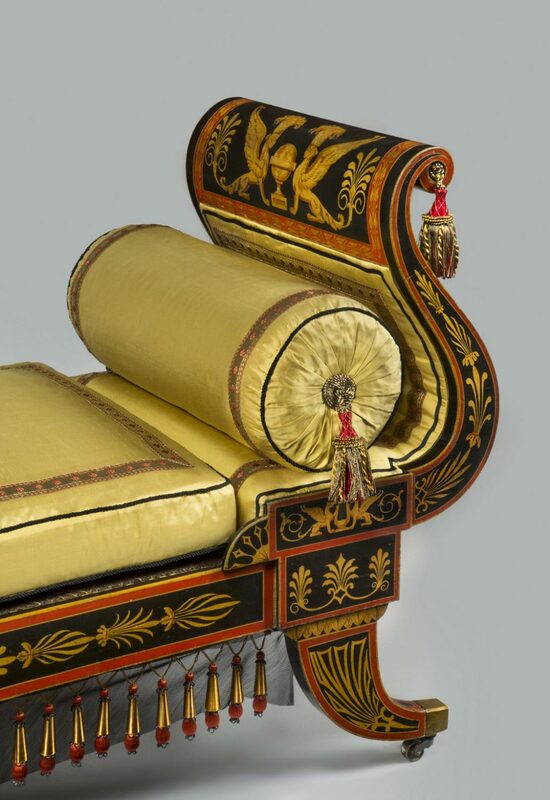 Inspired by French and English designers working in the Neoclassical idiom, Latrobe's preference for a correct archaeological style drawn from Greek antiquities is clearly demonstrated in this double scroll-armed sofa with sabre-shaped legs from a suite of drawing room furniture for the Waln house. The other surviving components of the group include seventeen side chairs, two card tables, two window benches, and a pier table. 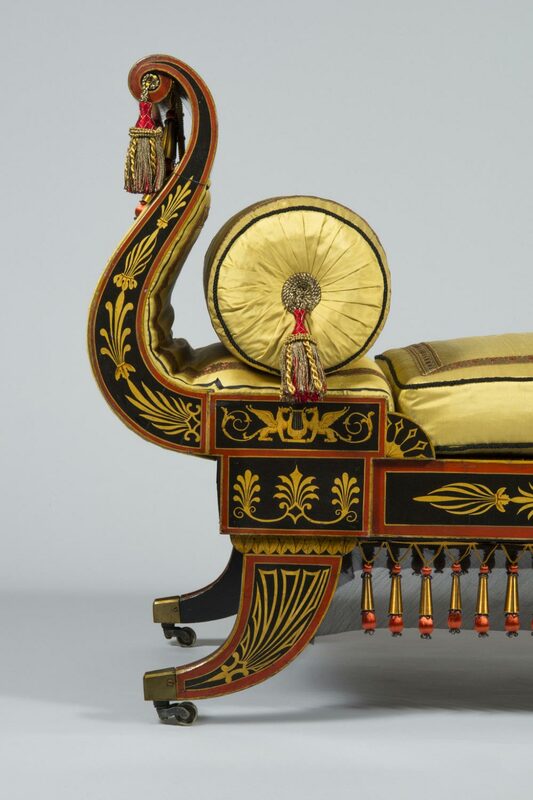 The Museum's group has remained in remarkable condition, retaining its original ornate painting and gilding, caned seat platforms, and traces of the silk upholstery. Jack L. Lindsey, from Philadelphia Museum of Art: Handbook of the Collections (1995), p. 269.